The ski resort Les Contamines differs from the more famous neighbours Megeve and Chamonix by the fact that even in the high season you will not see a large number of tourists here. This place is ideal for those who prefer the rest in seclusion and quiet atmosphere, with good snow and long descents, as well as for recreation with the whole family. The village of the same name, which is the centre of the resort, saved all the charm of antiquity, and at the same time Les Contamines is a modern comfortable resort with a huge and diverse ski area and developed infrastructure. The ski runs of the resort are known by their length and magnificent snow cover. Every year in January, international freestyle competitions take place in Les Contamines, which certainly speaks of the excellent quality of its trails. Les Contamines Montjoie is located in the centre of Mont Blanc in Haute-Savoie, the resort is situated at the foot of Mont Blanc between such famous resorts as Megeve and Chamonix. But, unlike them, Les Contamines is a relatively small and moderately quiet alpine village. 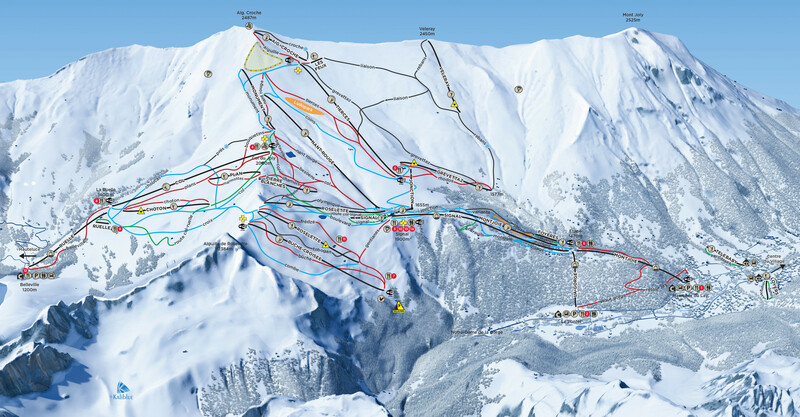 The skiing area is not too great - only about 120 km of tracks, but it is a part of the united region of skiing called Evasion Mont-Blanc with a single ski pass. The skiing area of the resort is divided into four zones: Village - the nearest to the village with the simplest green slopes, more suitable for beginners. The routes of the Montjoie zone are also quite simple, but the Tierces zone will please athletes with experience with their interesting alpine descents. The Roselette zone is closed on both sides by small ridges, it is rather compact. Trains are operated by the French national rail company SNCF. The time of transfer to the resort from these airports is approximate because the transfer time could be impacted by traffic conditions and current weather also. Here, in the Alps2Alps, we do our best to guarantee our rates for all transfer services will be available at any time. Even if you go to Les Contamines in the high season, you still can be sure of the most beneficial prices for our services. Alps2Alps never overstate prices at any time and by any reason. We consider as many factors as possible to lower our standard rates, whenever it can be done. We always recommend our customers to book the transfer in advance in order to get access to the best offers. If you are looking for the best deals, notice that travelling outside of the peak season or in the middle of the week leads to the most savings. We usually give discounts of up to 60% for the transfers in the middle of the week than on the weekends. Final quote for you will also be dependent on the availability of the car, the transfer schedule, the use of the vehicle and other costs like tolls and parking fees at the airport. If you have any questions, please contact us directly so that we can help you quickly according to your needs. Despite the relatively low skiing heights, the snow on the surrounding slopes retains the winter quality until late spring - the closeness to Mont Blanc is affected. Most of the resort's trails are most suitable for middle skiers and snowboarders. Fans of freeride will also be satisfied: around you can find many interesting options for free descents and excellent virgin snow. Les Contamines is a quiet and peaceful place, mostly preferred by fans of secluded skiing holidays. In addition to mountain skiing, there are many other interesting entertainments waiting for you in Les Contamines. These include 26 kilometres of plain skiing, specially equipped areas for extreme off-piste skiing, as well as great opportunities for snowboarders - the snowboard trails here are also divided into several levels of difficulty, there are a halfpipe and a snowboard park. As Les Contamines is more classified as a family resort, it’s a perfect choice to spend your holiday with all family. In Alps2Alps we know what exactly our clients expect from the transfer company. It’s not so hard to guess: arriving on time, in a comfortable and friendly atmosphere with paying the lowest cost for your transfer. It is always better to book your shuttle to the resort as early as possible in order to get the biggest economy of money. Don’t doubt to call our customer service team or fill out the online request form. The best trips to Alpine ski resorts always start with the best transfers - exactly what Alps2Alps is!